Hello and welcome to ninth episode of ‘Saga In Stone’, the saga of Islam in India told by its monuments. It is said that stone never lies. It is too cold blooded to lie. Kashmir was a different scenario from other sultanates where Indo-Islamic architecture took root. The weather was different. The landscape was very very different. And even the philosophy was different. Unlike other parts of the country, where Islam was brought primarily by the rulers and invaders, Kashmir saw the advent of Islam through the sufi preachers. These sufi preachers were generally not a part of the orthodox Islam. They differed in their ideology by degrees, and gave a much more mystical flavor to a primarily practical religion like Islam. 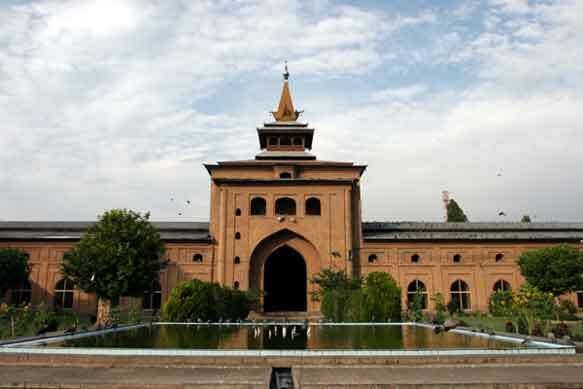 The challange for the Kashmiri builder was to put forth the philosophy through his buildings. The challenge was for these builders to take their craft to such a level that it complements the best landscaping work of the biggest builder of them all- God. The story of Islamic architecture in Kashmir begins with the beginning of Islam here. Situated on the right bank of the Jhelum river, Shah Hamdan’s Khanqah is one of the most exciting pieces of architecture in the country. It consists of a Mosque and the private meditation chamber of Shah Hamdan. It is square in plan with each side measuring 70 ft. The structure of the Mosque is two-storied, above which is a low pyramidal roof. Surmounting the roof is an open pavilion for the muezzin. Over this rises the steeple, with gable-like projections at the foot. At its top is the finial – 125 ft from the ground. Much of the walling of the lower portion of this mosque is formed of logs of wood. The foundation of the Muslim rule in Kashmir dates back to 1339, when Shah Mirza, the wazir of the king Udayana Deva, dethroned his master. He then laid the foundation of his own dynastic rule. Shah Hamdan was a great mystic. He was born in 1314 A.D. at Hamadan in Persia, hence the name Shah hamdan. His interest towards religion was apparent from childhood as he memorised the Holy Quran in his early boyhood and went on to study theology. It was here that he first got attracted towards Tasawuf(mysticism). He became a disciple of sufi saints Sheikh Abdul Barkat Taqi-ud-Deen and after his death Sheikh Sharif-ud-Deen Mahmud Muzdaqani. The sufis believed in experience instead of purely theoretical learning. They told him that his education will only be completed by extensive travelling. Shah Hamadan travelled to several countries, preaching truth as he saw it. In his 21-year long journey he came in contact with several sufis and mystics form various parts of the world. By the time he returned to his native place, Timur had started the persecution of the Syeds. This forced Shah Hamdan to leave for Kashmir. Seven hundred Syeds are said to have accompanied him here during the reign of Sultan Shahab-ud-Deen in 1372 A.D. The present Ziarat(shrine) of Shah Hamadan is said to have been erected on a spot which he used as retreat on the Vitasta. This is where he used to discuss religion and philosophy with the Hindu divines and sanyasis. These discussions perhaps played a major part in the development of the Sufi thought in Kashmir, which proclaimed the unity among men and among all religions. Shah Hamdan influenced thousand in his lifetimes. He continues to influences millions even today. Six hundred years after his death, people still throng to the Khanqah, they know as Khanqah-i-Mualla. They share their problems and ask for miracles. And a lot of times, it is said, they get them. Wood was an integral part of Kashmiri architecture much before Islam arrived. Islamic builders used this tradition to their fullest advantage. The whole structure is built exclusively of timber. The interiors of the mosque area is an expression of sheer joy. A splash of colours embodies this joy of the spirit. Rich brown wall-panels with Allah’s names written on them, and the painted ceiling makes this monument a beacon of sheer beauty. These decorative patterns reflect the famous papier mache work of Kashmir. The hall is rectangular in plan, measuring 63 ft by 43 ft. The meditation room is known as Hujra Khas or the ‘Special Chamber’. The exteriors of this room have been decorated with beautiful glass work. It is said that these pieces of glass reflect the intentions of the faithful. If one is going inside the hujra with unclean intentions, his true feelings are sure to show up. Two sacred relics – a banner of the Prophet Muhammad and a wooden pillar against which he usually reclined in his tent are kept in this room. Both these relics were brought to Kashmir by Shah Hamdan and were deposited in this mosque. The holy relics are not removed from the repository except on occasions when people face some calamity like epidemics, famine, draught etc. The two relics are then taken out in procession to the Idgah. Prayers are held there for the whole day. In the evening, the relics are again brought back in a procession and deposited in the shrine. Shah Hamdan’s khanqah has suffered thrice from fire, the scourge of all the wooden architecture. In 1731, the entire Khanqah was again engulfed in fire. It was finally reconstructed in 1733. The khanqah of Shah Hamdan proved to be a watershed both for Islam and Islamic architecture in Kashmir. It was the beginning of Kashmir’s love affair with Islamic architecture. The Jama Masjid of Srinagar is the by far the most impressive specimen of Kashmiri architecture. It is also the most ‘unlike mosque’ mosque here. Sultan Sikandar Shah laid the foundations of this mosque in 1398. It was in the reign of this king that the saints Shiekh Noor-ud-din, better known as Nund Rishi, and Lal Ded, made their impact. These saints were the major ideological force behind the secular traditions of Kashmiriyat. The earliest structure was completely made of timber. It was completed in the reign of the Akbar of Kashmir, Sultan Zian Ul Abidin. But then, fire struck. It struck three times- once in the fifteenth century and twice in the seventeenth century. It is said that the last time, when it was engulfed by fire, all the nearby houses were vacated and destroyed so that the chance of recurrence would be reduced. Today, looking at the busy marketplace and the residences that surround it, the idea of this beautiful mosque existing in isolation seems strange but beautiful. The current structure was built during the time of Maharaja Pratap Singh. Maharaja created a special fund for the purpose by introducing a cess at the rate of 6 pies per rupee of land revenue. This is the largest mosque in Kashmir. It can accommodate 1,50,000 persons at a time. The entire area is contained within a lofty exterior wall making a rectangle with two sides measuring 384 ft in length. The wall has an average height of about 30 ft. It is made completely of brickwork. No more woodwork for it, at least externally. Because the interiors hide the greatest achievement of this mosque- the lofty wooden pillars, a total of 378 in number. Each of them, made out of a single log. Elegance comes naturally to these pillars. It is believed that one of these pillars is from paradise. It won’t be too surprising if all of them turn out to be from the same heavenly source. The Kashmiri architect found his greatest mosque in this monument. His place in posterity reserved, he turned towards other structures. After this, the Kashmiri creations had the maturity of experience. But the magic of experimentation was lost. But Jama Masjid lives on, magical in its splendor, a mystical aura of peace surrounding it. This graveyard at Zaina Kadal in Srinagar houses the next achievement of Kashmiri Islamic architecture - Tomb of Sultan Zain-ul-Abidin’s mother. Zain Ul Abidin was the most illustrious of the Kashmiri kings. He was known far and wide for his justice, tolerence and love for his people. He was known as the badshah -the great king. He was also one of those rare monarchs throughout the march of history to have only one wife. This tomb was constructed by Zain Ul Abidin, sometime in the mid 15 the century. It is popularly known as badsha, owing to its being built by the greatest kashmiri badsha of all times. The monument is square in plan. The superstructure consists of a tomb chamber roofed over by five domes. The shape of these domes, together with the design and form of the drums on which they are placed trace their influence to the Persian architecture. The whole of the upper portion has been reconstructed in rubble and brick, after dismantling the earlier superstructure. The construction of the monument is of brick and plaster. Exteriors have been embellished with glazed tiles and molded blue bricks. The grave of Zain Ul Abidin is located in the adjoining graveyard. It is said that the day he died, his subjects went without food. They said that he had to die because heaven was in chaos and needed his presence for its consolidation, as he had done for Kashmir. A number of interesting monuments were built after this period. They might have lacked the opulence of Shah Hamdan’s khanqah and the sheer brilliance of Jama Masjid. But they did not fall short on charm. The tomb of the revered saint Madani Sahib was erected in Srinagar in 1444. This tomb was considered as one of the best examples of Islamic architecture in Kashmir. It was especially famous for an unusual decorative element in its arch. This was the figure of a creature with the body of leopard and the torso of a human being. It was shooting with a bow at the dragon which formed the end of its tail, while a fox looked on from the flowers. Now this tomb has been extensively renovated, and not much of the original structure is left. Another interesting example of wooden architecture is the khanqah of Naqshband Sahib, a renowned man of religion whose tomb is in Bukhara. This building is made on the lines of the Khanqah of Shah Hamdan. Though it is not as spectacular as the earlier masterpiece, it has a certain charm to it. Percy Brown, the renowned art historian said about the architecture of Kashmir, “the similarity of this form of kashmir architecture to the timber construction of the mountainous countries cannot be overlooked, particularly its likeness to that of Scandinavia and also to the regions of Alps.” He points out the similarity it had with Norway churches which have similar sloping roofs rising in tiers along with gables and eaves. But this he felt was not a pointer towards any common source of inspiration but the similar climatic conditions that they had to face and the availability of same building material. Not every example of Islamic architecture in Kashmir was built by the local Sultanate. The great Mughals had their contribution to make, though not a great one. Pathar Masjid is a beautiful mosque built in 1623 AD by empress Noorjahan. It has been made in characteristic Mughal style, and is very different in style and execution from the wooden architecture of Kashmir. The only thing distinguishing it from similar mughal mosques is its usage of locally available white sandstone instead of marble, which was difficult to transport. The architect of this mosque was Malik haidar Chaudara. It is said that when Noorjehan was asked the amount of money that she spend on this mosque, she pointed to her jewelled slippers and said “as much as that.” This angered the local clerics and for a long time, the mosque fell out of favor. Dastgir Sahib is a comparatively new khanqah , built in early eighteenth century. The exteriors of the building are quite ordinary. But the interiors have been decorated lavishly. The mosque has been beautifully lit, symbolizing the fact that according to the Koran, Allah is the light of the heavens and of earth. The tomb here is belongs to Mohammad Razil, eighth generation of the peer Dastgir, who is buried in Baghdad. It is one of the holiest places in Kashmir, with a huge following. Islamic architecture in Kashmir had some great beginnings. But like so many prodigal sons, it refused to grow past its achievements.. But then, a building like Jama Masjid comes once in a millennium, and kashmiris were the ones to build it. Times were changing now. A new dynasty had taken the country by storm. The great Mughals had arrived. Next week, we’ll tell you more about the great architecture of the great Mughals. Shabba Khair, Shubh Ratri.